In December of 2002 (really, 2002, 12 years ago), I decided that the crappy former Sony self-amplified speakers with blown amplifiers that I had wired into my stereo as surround speakers really didn’t sound very good as they were, by then, 7 years old and the holes in the plastic housing where the adjustment knobs once protruded were covered by aging gaffers tape. At least it was stylish black tape. 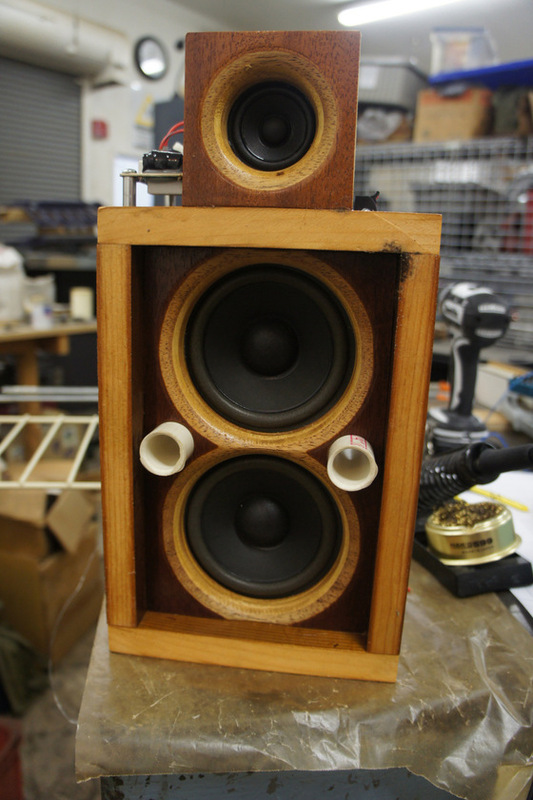 I saw on ebay a set of “Boston Acoustics” woofers and tweeters back in the time when ebay prices could be surprisingly good. 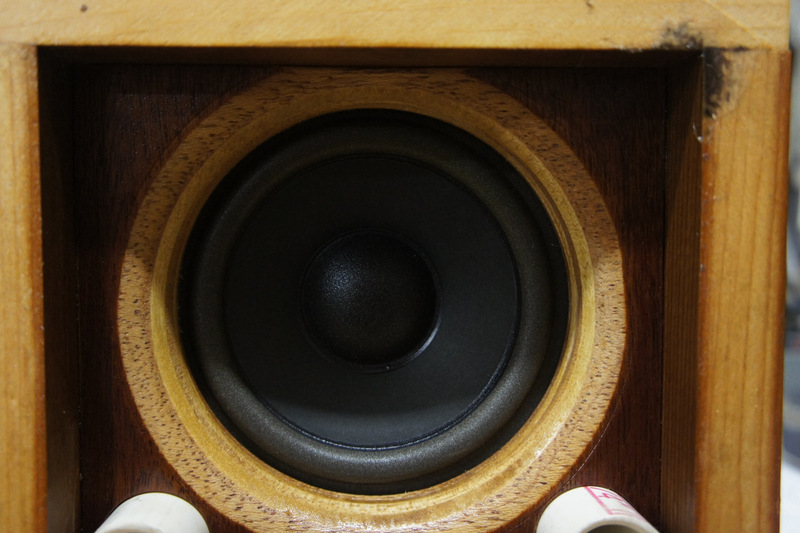 Boston Acoustics was a well-respected company at the time making fairly decent speakers. 36 woofers and 24 tweeters for $131 including shipping. About 100 lbs of drivers. And thus began the execution of a fun little project. 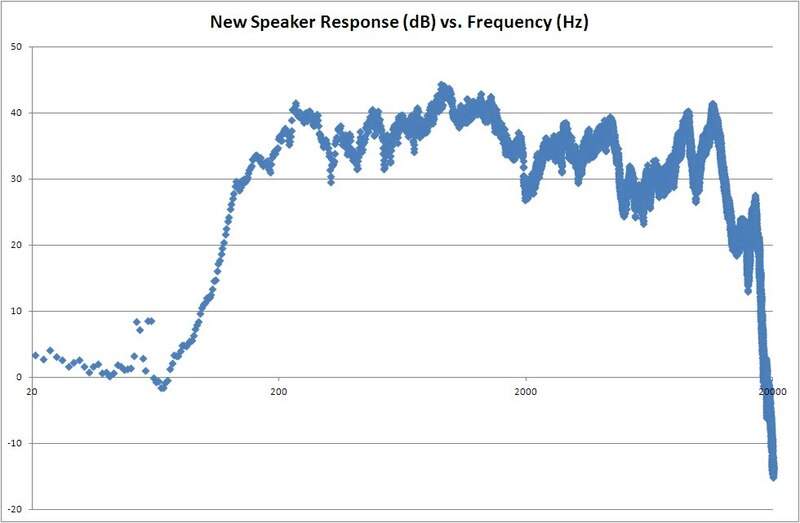 I didn’t have enough data to design speaker enclosures around them, but about a year later (in 2003), I found this site, which had a process for calculating standard speaker properties with instruments I have (frequency generator, oscilloscope, etc.) I used the weighted diaphragm method. In January of 2009 I found a good crossover at AllElectronics. It was a half decent match and since it was designed for 8 ohm woofers, I could put two of my 4 ohm drivers in series and get to about the right impedance for better power handling (less risk of clipping at higher volumes and lower distortion as the driver travel is cut in half, split between the two). PORT LENGTH = 10.48CM = 4.126"
WIDTH = 12.613 = 4.829"
HEIGHT = 20.408 = 7.82"
DEPTH = 7.795 = 3"
Dual 80 mm woofer ported enclosure as rendered by CAD. There was no way to fit the crossover inside the enclosure as the drivers have massive, magnetically shielded drivers, so they got mounted on the outside. 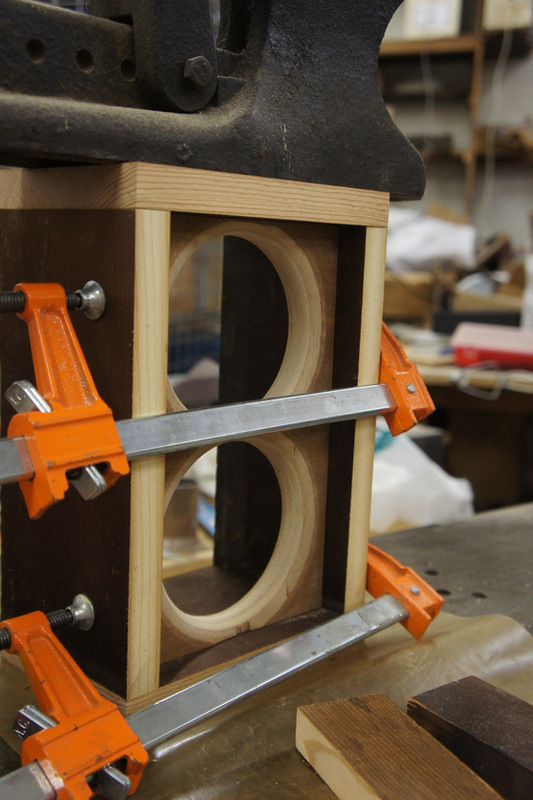 The speakers were designed for inside mounting (as opposed to flange mounting) so I opted to radius the opening to provide some horn-loading. I also, over the course of the project, bought some necessary tools to be prepared for eventually doing the work: a nice Hitachi plunge router and a set of cheap router bits to form the radii and hole saws of the right size for the drivers and PVC port tubes. This fall, Oct 9 2014, everything was ready and the time was right. The drivers had aged just the appropriate 14 years since manufacture and were in the peak of their flavor. 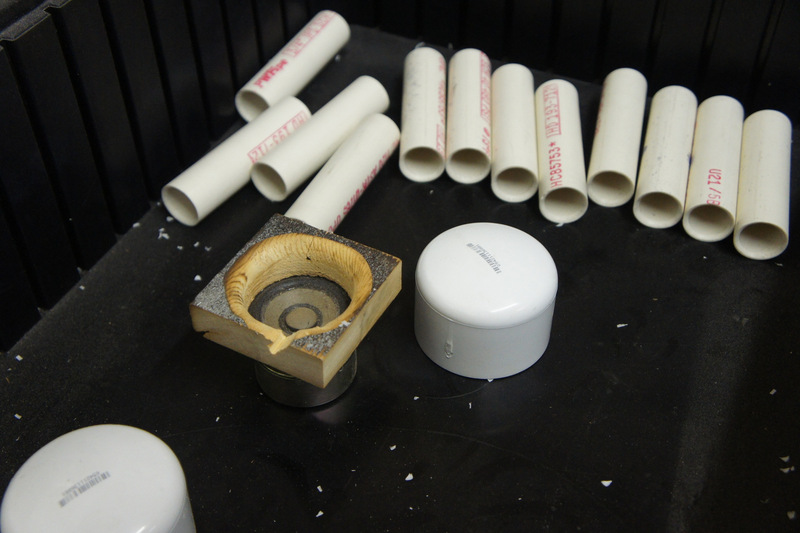 I started by cutting down some PVC tubes to make the speaker ports and converting some PVC caps into the tweeter enclosure. My first experiment with recycled shelf wood for the tweeter mounting plate failed: the walls got a bit thin and it was clear that decent plywood would make life easier. I used the shelf wood for the rest of the speaker: it was salvaged from my building, which was built in the 1930s and is probably almost 100 years old. The plywood came with the building as well, but was from the woodworker who owned it before me. I got to use my router after so many years of contemplation to shape the faceplates, fabricated from some fairly nice A-grade plywood I had lying around. 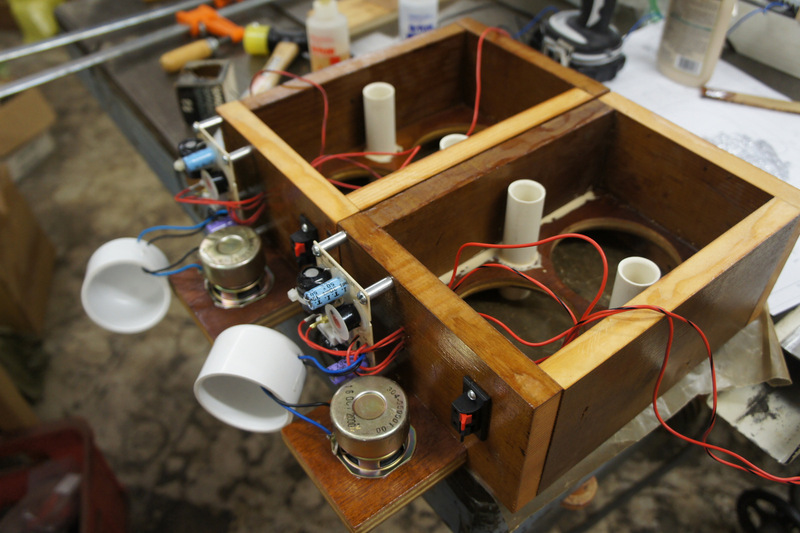 Once I got the boxes glued up, I installed the wiring and soldered the drivers in. 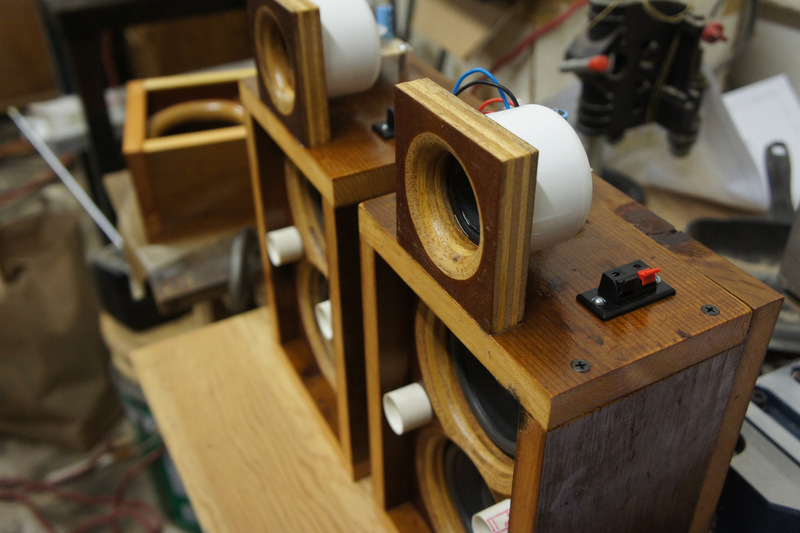 The wood parts were glued together with waterproof glue while the tweeters and plastic parts were installed with two component clear epoxy. The low frequency drivers had screw mounting holes, so I used those in case I have to replace them, you know, from cranking the tunage. I lightly sanded the wood to preserve the salvage wood character (actually no power sander and after 12 years, I wasn’t going to sand my way to clean wood by hand) then treated them with some polyurethane I found left behind by the woodworker that owned the building before I did. So that was at least 18 years old. At least. I supported the speakers over the edge of the table to align the drivers in the holes from below. Radius loading of the woofer. The speakers sound objectively quite nice, but I was curious about the frequency response. 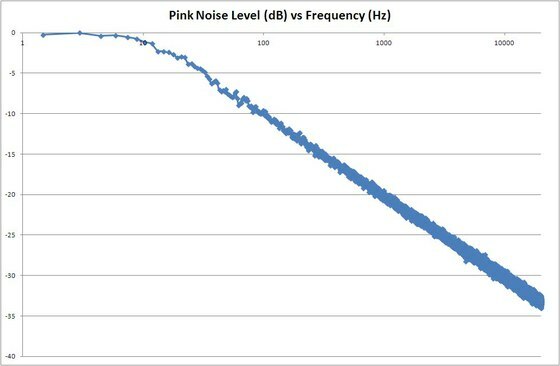 To test them I used the pink noise generator in Audacity to generate 5.1 6 channel pink noise files which I copied over to the HTPC to play back through my amp. This introduces the amp’s frequency response, which is unlikely to be particularly good, and room characteristics, which are certainly not anechoic. Then I recorded the results per speaker on a 24/96 Tascam DR-2d recorder, which also introduces some frequency response issues, and imported the audio files back into Audacity (and the original pink noise file), plotted the spectrum with 65536 poles, and exported the text files into excel for analysis. It’s pretty good – a bit off plan below 10 Hz and the random noise gets a bit wider as the frequency increases, but it is pretty much what it should be. First, I tested one of my vintage ADS L980 studio monitors. I bought my L980s in high school in about 1984 and have used them ever since. In college I blew a few drivers (you know, cranking tunage) but they were all replaced with OEM drivers at the Tweeter store (New England memories). They haven’t been used very hard since, but the testing process uncovered damage to one of my tweeters, which I fixed before proceeding. 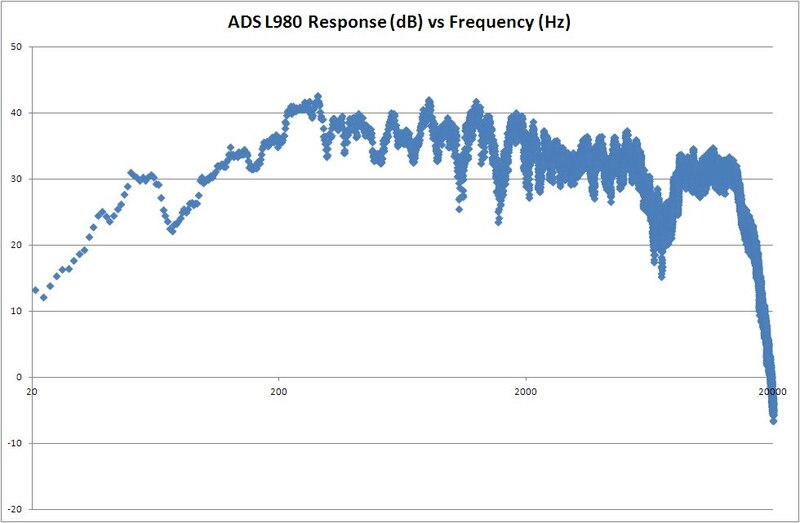 The ADS L980 has very solid response in the low frequency end with a nicely manufactured 12″ woofer and good high end with their fancy woven tweeter. 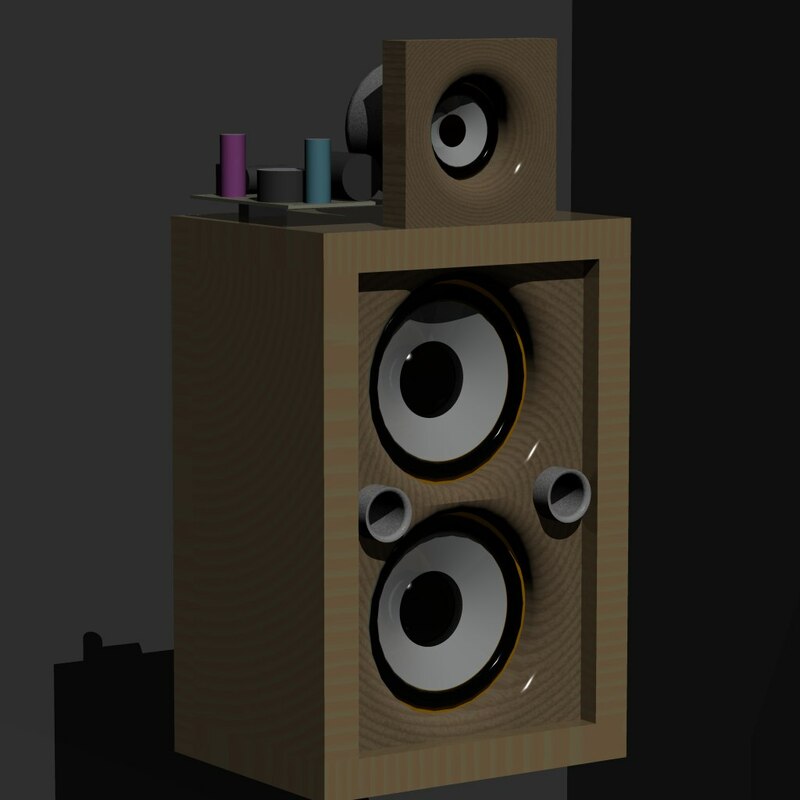 A 3 way speaker, there are inevitably some complexities to the frequency response. 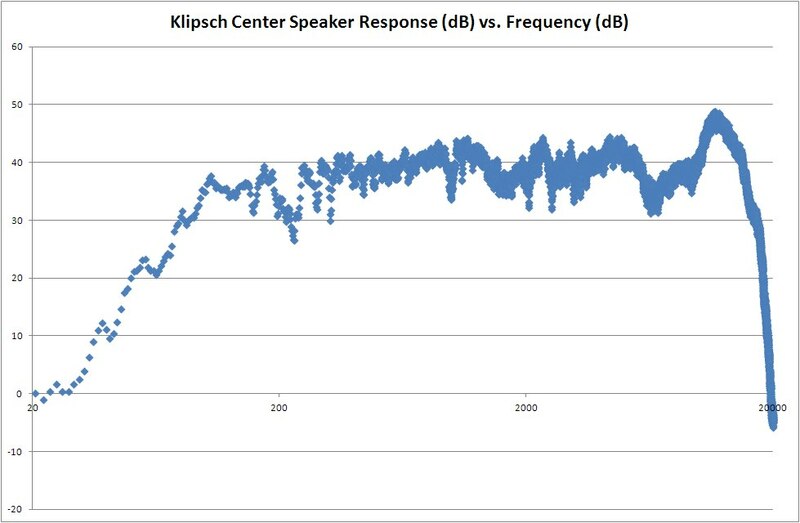 It isn’t too bad, but clearly weaker in the low frequency, despite moderate sized dual woofers and with a bit of a spike in the high frequency that maybe is designed in for TV and is perhaps just an artifact of the horn loaded tweeter. It is a two way design and so has a fairly smooth frequency response in the mid-range, which is good for the voice program that a center speaker mostly carries. And how about those new ones? Well… not great, a little more variability than one would hope, and (of course) weak below about 100Hz. I’m a little surprised the tweeters aren’t a little stronger over about 15kHz, though while that might have stood out to me in 1984, it doesn’t now. Overall the response is quite good for relatively inexpensive drivers, the low frequency response, in particular, is far better than I expected given the small drivers. The high frequency is a bit spiky, but quite acceptable sounding. 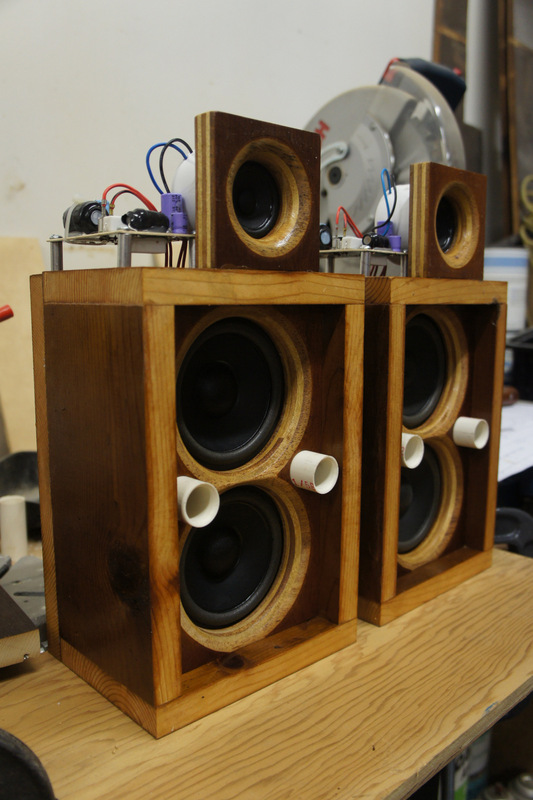 And they sound far, far better than the poor hacked apart Sony speakers they replaced. 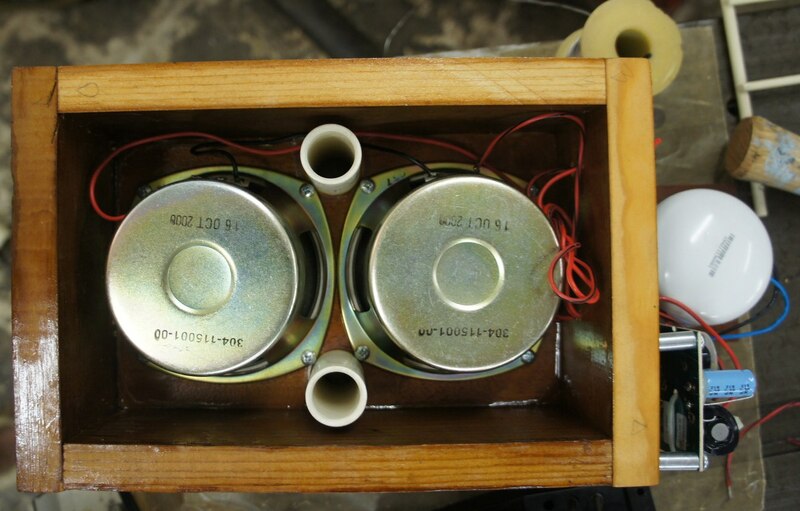 Design and fabrication of low cost speakers around components found on ebay and other cheap sources. you should have done the freq response tests of your Sony junkers first – just for laughs!